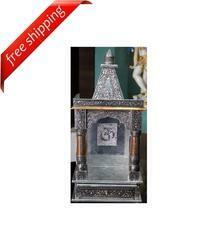 Oxidized temple is mainly designed for personal puja at home in Hindu religion. Home temple can be gifted in wedding ceremonies, festivals like Navratri, Diwali or housewarming party [Gruh pravesh] and even during a special pooja. Oxidized mandir is made up plywood and plated with oxidized aluminum and copper. Oxidized temple utilizes tarnish proof and rust proof quality nails. Oxidized ghar mandir is based on actual mandir design. Backed by a rich industrial experience, we are engaged in offering a commendable array of Oxidized Temples.